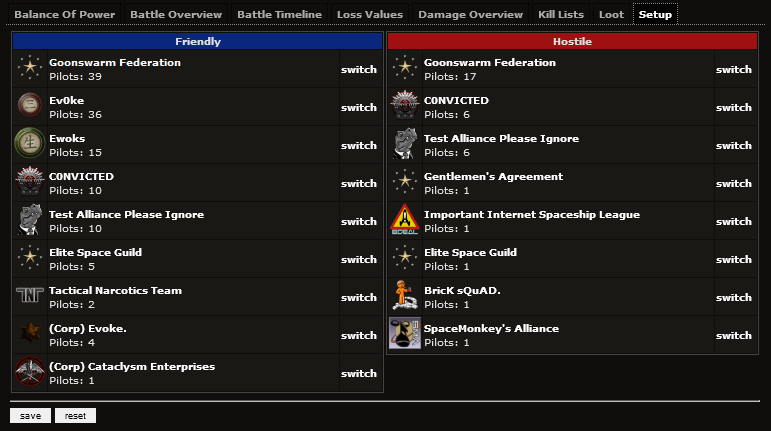 i've been running a modified version of battles_mod (better related kills page) on my alliance's killboard for quite some time now. This mod originally was made by Quebnaric Deile. He als wrote the fleet_battles mod (original thread: http://eve-id.net/forum/viewtopic.php?f=505&t=13518) that displays an overview of all fleet battles including some very nice stats. As i updated the last one to work with EDK4 and was asked to do the battles_mod too, i thought it was a very good opportunity to combine both mods into one mod. Both use quite a bit of the same code, so it was the next logical step. 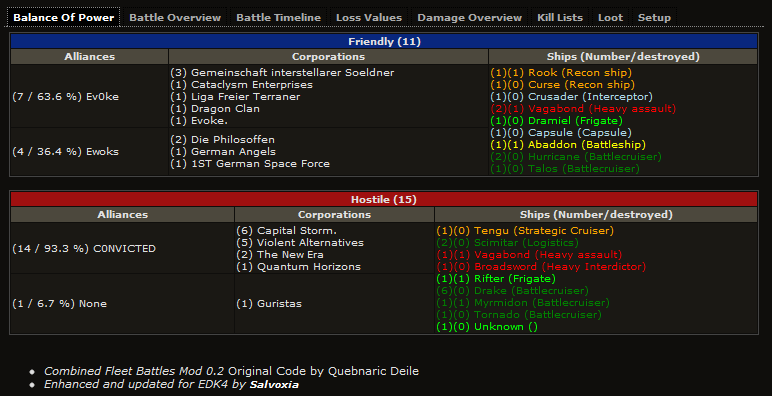 Here it is now, the initial version of the combined mods for related kills and fleet battles! Filtering for Fleet Battles Overview NEW! 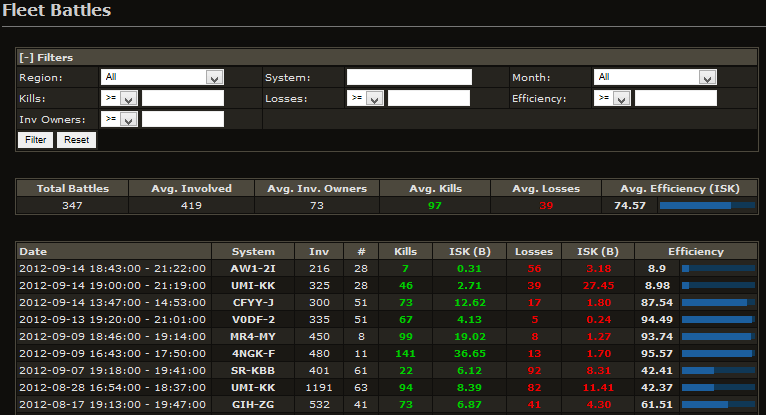 This mod enables killboard administrators to manually fix battle reports by assigning the sides they know it's right. The assignments are persistent and will be saved in a separate database table. To restore the original mess the side assignments can easily be deleted again. 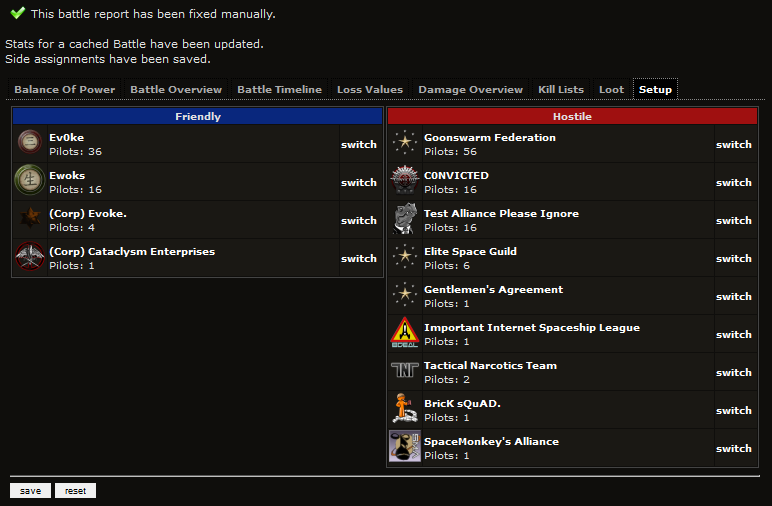 If battle stats are affected for a cached fleet battle the cache will be updated es well. In rare cases, when the time frames don't match exactly, the fleet battle cache for this battle will be deleted and will be rebuilt with the next execution of the cronjob. The "fixed" notification will be displayed for any battle, that has been fixed, so people know. To get back the original assignments the "clear" button in setup tab can be used. When fixing a fresh battle where killmails are still trickling in it might be necessary haat the report has to be fixed again when all mails are posted. Side assignments will be respected when the fleet battle cache gets updated. Important: This feature does NOT alter/delete any of the original killmail data! You can simply deactivate it or clear the side assignments table in the mod settings if you run into serious problems! 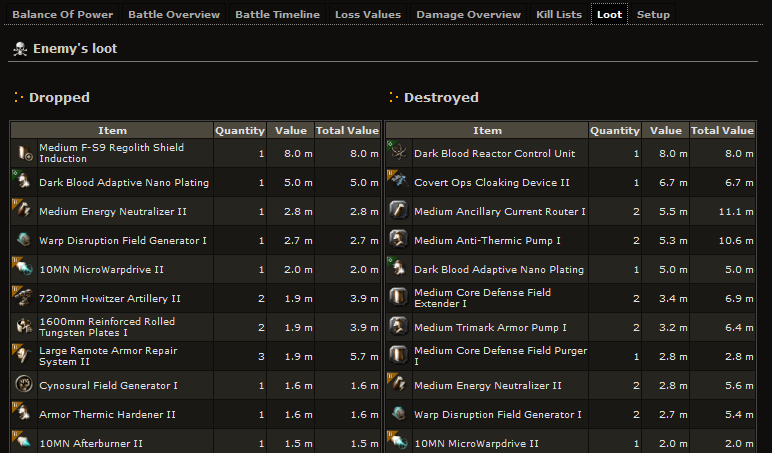 Although the two old mods are combined in this one, it can also be used to enhance your related kills page only. 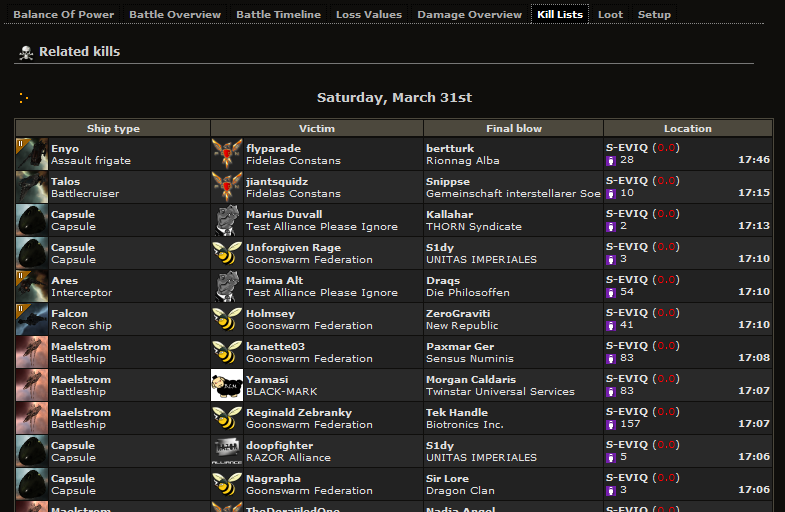 You don't have to use the Fleet Battles overview, it will not slow down your Killboard! 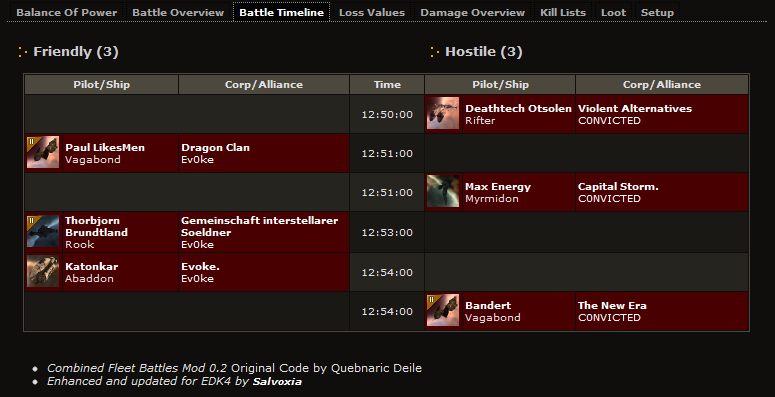 check if you're running the edk4 version of fleet_battles; if you do, disable it! if you don't want to use the fleet_battles functionality, you're done. Just like every piece of software this mod will have bugs and errors. If you find any, please post them here in the usual way, i will try to help and fix the problems. Updated versions will be attached to the opener post. Tested with a clean EDK4 installation and PHP5/7. Last edited by Salvoxia on Sat Sep 15, 2012 12:20, edited 16 times in total. thanks, i fixed it, attachment in opener is updated. As soon as I log in I'll be sending you more. Do you think you can work in "Include Adjacent"? Zagdul wrote: Do you think you can work in "Include Adjacent"? well, there i really get to feel the old code. Perhaps i should have refactored it completely on the base of the current kill_related in edk4. Perhaps i will. Nice, and thanks for your time and effort. Is there possible to move pilots/corps/aliances from friendly to hostille gang or back? When we fighting with RR, SB, capitals gang many times ballance of power shows hostiles as friendlis, and its destroy batlle look?